TEAM MANGO: From left, Dennis Igarashi, Leonard Kim, Audrey Kamiya, and Eric Hayashi meet at Cherrystones in Gardena ahead of next Saturday’s Mangoes at the Moana Festival. If any Rafu readers happen to be in Waikiki next Saturday, please stop by and say hello, or howzit brah. There’s going to be a little bit of down-home Gardena at the historic Moana Surfrider hotel for their 6th annual Mangoes at the Moana Festival on July 19. The festival is a celebration of all-things mango with cooking demonstrations, competitions for “best mango,” and seminars on how to grow the sweet tropical fruit. Langley Ukulele Ensemble, a Canadian ukulele group, will be performing under the hotel’s magnificent Banyan trees. We’ll be there as well. I’ll be helping my husband Eric, who is selling his Eric’s Edibles mango macarons. 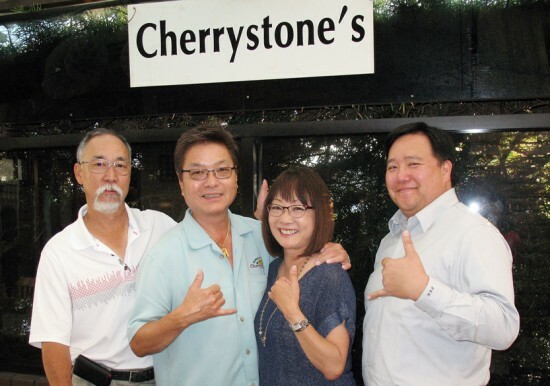 Leonard Kim of Cherrystones will also be there with his famous chili. (Watch out, Zippys!) We leave on Thursday, so I won’t be seeing Horse for our usual pick-up of his column that morning. Incredibly the festival is being coordinated from the Mainland by Audrey Kamiya, a SoCal native and formerly the outlet manager of the Moana. Although now the food and beverage outlets manager at the Westin Bonaventure, Kamiya has been handling all the details in the run-up to the festival. I don’t think you could do something as complicated as organize a festival from so far away without having a true passion for your work. We all work for our paychecks, but having that passion is so important. It’s why the staff of this newspaper spend their weekends covering community events such as obons, and kenjinkai picnics. It’s why the leaders of Kizuna, seeing a void, have created an organization for Japanese American youth built around their passion for this community that they’ve grown up in. For my husband, an appraiser by day, that passion is in these delicate little cookies. Crisp yet chewy, sweet and beautiful, a macaron is a labor of love — each cookie is the end product of hours of precise work, sifting, stirring, piping and baking. Baking is not my passion however, but I try to help however I can. Lately there have been many long, long hours in the kitchen. If I’m a writer/editor when I’m at The Rafu, with Eric, I am a worker bee, sous chef, or at least a somewhat capable dishwasher. We’ll see how the end results fare in Hawaii. As I turned on my computer today, I gasped at the news that LeBron James is heading back to play in Cleveland. A more intriguing development for Asian American basketball fans is the news that Jeremy Lin is going to be in purple-and-gold as a L.A. Laker. I got to see Lin play with Houston against the Lakers last season, long after “Linsanity” had died down. He seems to have settled into the role of a facilitator, something the Lakers will surely need, regardless of who else joins Kobe Bryant next season. As a UCLA fan, I keep hoping for the return of forward Kevin Love to L.A, though that seems unlikely. Lin hasn’t lived up to that magical stretch in 2011, when he was called off the bench and led the New York Knicks with his offense and defense. But the phrase “Jeremy Lin to the Lakers” was trending worldwide on Twitter in the hour before the story broke and he still has considerable appeal. Could the Lin signing be fortuitous timing for the JA community? He’s a kid grown up in the Asian leagues and Little Tokyo Service Center is pushing its capital campaign for the Budokan of Los Angeles. It’s way too early to speculate, yet hopefully we’ll see him at an upcoming Budokan event. The Harvard grad is a smart guy. He should get that the gymnasium would be great for the downtown community, as well as Asian American basketball. Maybe categorize this under “things that Nisei do.” We were talking about hashi (chopsticks) and how they’re sometimes used for purposes other than their original intent, especially by Nisei. In my case, I pointed out that my dad sometimes likes to eat potato chips with hashi. Eric countered with his grandfather, who would use chopsticks to eat buttered toast. It makes sense if you want to keep your hands clean, but those are just not foods I would think of picking up with chopsticks. At this year’s Nanka Shiga Club new year’s party, Jolene Sekijima created a game to test hashi dexterity: using hashi, contestants had to pick up orange cheese balls and drop them into a container. It’s a good test of hand-eye-coordination. I wonder if any readers have any hashi stories and the creative ways that they’re used. They’re definitely more handy than the fork. 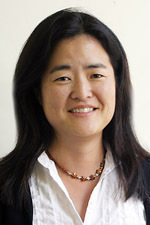 Gwen Muranaka is the English editor-in-chief of The Rafu Shimpo and can be reached at [email protected] Ochazuke is a staff-written column. Opinions expressed are not necessarily those of The Rafu Shimpo.